The Abe Statement: Did Abe Apologize? 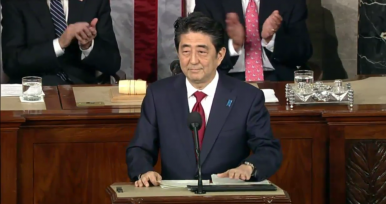 Abe’s statement included the right language — but not in the right way. So begins Japanese Prime Minister Shinzo Abe’s hotly anticipated statement on the 70th anniversary of the end of World War II. The official Cabinet statement, delivered on August 14, will be heavily scrutinized, particularly in China and South Korea, for evidence that Abe is attempting to avoid historical responsibility. In particular, outside observers were looking to see that Abe replicated key language from the 1995 Murayama Statement and the 2005 Koizumi Statement: the word “apology” and admissions of Japan’s “aggression” and “colonial rule.” In essence, the question was how Abe would explain what, exactly, Japan did wrong in World War II and the preceding years and how (if at all) he would offer an apology for those actions. So how did Abe do? Let’s take a look. On the question of what Japan got wrong, Abe provides a litany of missteps — but all are vague. The key words of “aggression” and “colonial rule” are there, but not in the context many in China and Korea hoped. First, Abe begins by emphasizing Western colonialism, not Japan’s. He even claims that “[t]he Japan-Russia War gave encouragement to many people under colonial rule from Asia to Africa,” presumably as a symbol that a non-Western country could defeat the European powers. Yet Abe’s formulation ignores the fact that the Japan-Russian War actually took place in China (Manchuria) and Korea — and is perceived by those countries as two rival colonialist powers fighting for dominance over the Chinese and Korean people, not as “encouragement.” In other words, Abe got off to a rough start. “Japan gradually transformed itself into a challenger to the new international order… Japan took the wrong course and advanced along the road to war,” Abe said. It’s a clever formula — it allows Abe to use the words with only the most tacit admission that Japan was actually guilty of “aggression” and “colonial rule” in the first place. But as with most compromises, it’s unlikely to leave anyone truly satisified. Interestingly, Abe does include an oblique reference to the “comfort women” issue, which is new: “We must never forget that there were women behind the battlefields whose honor and dignity were severely injured.” But there is no apology or claiming of Japanese responsibility. If this was meant as an olive branch to South Korea, it’s unlikely to be an effective one. On a side note, Korea was curiously absent from most of the specific references to victim countries. Abe mentions “the Chinese people who underwent all the sufferings of the war” and “former POWs of the United States, the United Kingdom, the Netherlands, Australia,” in the context of praising these groups for their efforts at tolerance and reconciliation. Korea, however, only appears once in the speech, as part of a laundry list of countries Japan wronged. Seoul, which had already felt left out of historical gestures, will take note. To a layperson, this sounds very much like an apology, and quite an emotional one at that. But analysts in China and South Korea had specific expectations, which they made quite clear well in advance: they wanted the word apology, which is conspicuously absent. Abe does not even use the word “remorse,” which many had expected him in include. Before the speech, media reports said Abe would not apologize out of concern that doing so would require the Japanese government to continue to apologize in perpetuity. That sentiment seems to have guided the final version, which may win Abe points domestically but will not play well with China and South Korea. Should the United States Be Blamed for Japan’s Historical Revisionism? In hindsight, exonerating Japan’s Emperor was a grave mistake.